Tania León wasn’t familiar with the story of the Little Rock Nine when she was approached by The University of Central Arkansas to compose the opera to commemorate the 60th anniversary of the event, which took place on Sept. 25, 1957. Ironically, it’s what made her perfect for the job. The Cuban-born and raised, multi-award winning musician, composer and conductor was tapped to compose the opera of the seminal civil rights moment, in collaboration with prominent African American scholar Henry Louis Gates, Jr. and Thulani Davis. A preview of the opera, which will be completed in 2018, will be shown Monday night, on the day of the anniversary, at the University of Central Kansas. León is fueled by a humanist curiosity that defines her work as she defies expectations. Rejecting labels and preconceived notions, she delves deeper than most because she bypasses the easier questions in order to get to the true heart of the matter. The nine African American students who walked into the segregated, all-white Little Rock Central High School, lead by President Eisenhower’s National Guard, must have known they were putting their lives on the line to take that important first step. Yet sixty years later, the nation still grapples with division and questions of race and equality. Ahead of the premier of ‘The Little Rock Nine’, León spoke to NBC News to discuss her approach to the material, what really fuels racism and how you become a global citizen when you remember where you came from. What was your approach to such an iconic moment in American civil rights history? When the team at the University called me, I didn’t know anything about it. Working on this piece was very hard. Up to a certain point it’s distant because it's something that happened seventy years ago, but look at the consequences of what those decades have brought up until today. Hearing how we express ourselves against each other—it’s terrifying. Hearing an individual say that the color of their skin is better than the color of another person’s skin — to think the capacity of a person is conditioned by the color of their skin, it’s absurd. As an Afro-Cuban woman, did you identify with the struggle of the Nine? I don’t like the codification of people based on skin color, religions, or preferences. The entity of the person gets completely abolished when they are grouped. It’s like saying someone is Latin American but not mentioning what country they are from, without defining culture. I have an ample mentality in terms of that, which is much more human. Is that what made you take the job? When I did the research, I was more than interested for the simple reason: I was born on the street Salud in between Oquendo & Soledad. I come from a cradle where we were all united by poverty. We were multi-racial, multi everything but what we had in common is that we were poor. So that kind of diversity is how I see the world and without diversity, there is no progress. Since my arrival in the United States, I have tried to understand the mindset of people who feel they are better than others. And of course I have always seen it as a matter of convenience for one group that has certain —I don't want to call it privilege —but people that take advantage of using a certain mechanism to take advantage of a group of people because of the color of their skin. I’m approaching the Little Rock Nine as an ill in our society, more than one specific event in the United States. The ego likes to be a conqueror, it must win and create a loser. That kind of mentality of ‘I have to win, I have to beat somebody at all costs because that’s what makes me feel good about myself.’ It’s not just about being power hungry, it’s a sickness of the spirit of that individual...They are missing something. They are missing heart. It’s a sick heart. What is your antidote for that sick heart? I deal with it through my art and I talk directly to the public. When it comes time to talk about the person that has a heart and the person that has no heart, I choose to talk about the fact that both people have a mother. If one person does something against another person-what is it that they’re doing? Look at DNA-everybody is a different combination but how different are we if you need a kidney? Our organs are compatible and that’s what counts. It’s that internal compatibility that we want to make disappear, which is our only value. Our essence is sick. What we’re doing with the opera is nothing more than a narrative of that moment in history, but it has the possibility of starting a dialogue, which is what I would want — for us to have a sincere dialogue, not a cosmetic one. If you’re going to oppress the spirit of another human being, its because your spirit is also oppressed. Do you think there’s a way to beat that need to oppress? Slaves were imported into the country against their free will, stolen and sold and made to work for the wealth, aggrandizement and abundance of of other people through an abuse of power and the killing of their self-esteem. I don't understand how human beings can have such a lack of empathy. There’s no compassion. We get attached to material wealth at the expense of our spiritual world. 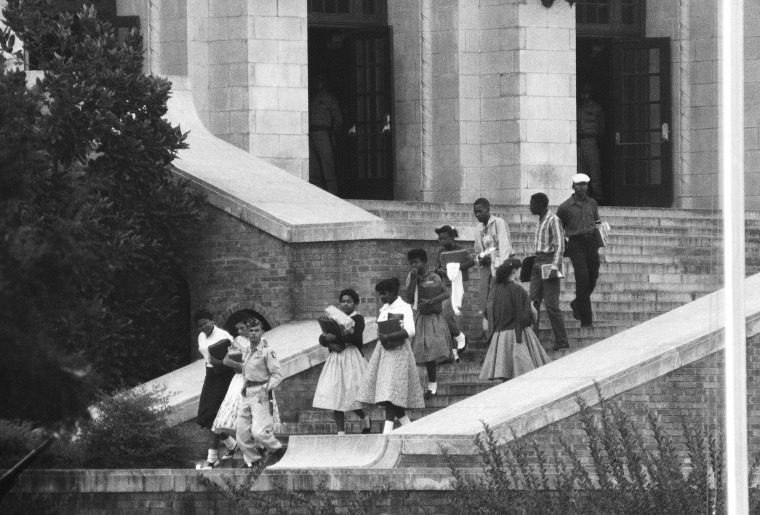 "I’m approaching the Little Rock Nine as an ill in our society, more than one specific event in the United States." The imaginary attitude that ‘We are worth more than another human being’ is the thing I think we need to confront. Stop talking about the color of somebody’s skin. People have a problem with the color of my skin and I don't have any. So why is another person so obnoxious and bothered by the way I look? Because of the way I speak or because of the language that I speak? Or because I came from where? They're all excuses for power to maintain power. Look at immigration. Human beings have been walking the world since day one. This is what we have been doing since the beginning of humanity. So why must it create so much trouble now? I believe that many centuries from now, the world won’t have countries because countries were created by fights, borders. You look at a map from two centuries ago and there are countries there that do not exist today. How does that factor into your work? When I returned to Cuba in 1979, my father heard my music. He told me that it was very interesting but asked where I was in my music. I didn't know he was going to die just months after that. He told me this right before I left for the United States. So it made me reflect a great deal on what I was saying in my music that would elicit such a question from my father. That’s when I started for the first time making inroads and creating influences of my culture, intertwining it with all of my academic studies which didn't have that much to do with the music of my origins. We try to continue being from a place of origin and we don't understand how much we have changed over the years. When I returned to Cuba for the first time, the kids in the family were saying that I talk funny, which means that my Spanish was not their Spanish. I couldn't dance the dances they were doing. It took me some time before I got the movement to be authentic and some people even asked me if I was from Panama—I was so hurt you have no idea. That’s what made me understand that we are sponges and we don’t understand how we absorb from other cultures. Cuban culture is an ajiaco of African, Spanish Chinese and what was left of Native culture, French culture. If I am compelled to absorb other sounds from other cultures that might influence my writing it is OK with me because that is my persona. What do you hope people walk away with after seeing you conduct? When I conduct an orchestra there’s always that moment where the audience is surprised because I am not what they expect. That's the role of a woman in an an orchestral world as a leader. Now I’m the kind of leader that looks how I look, I’m not seven feet tall, and people are genuinely surprised, like ‘It can’t possibly be!’ I feel like I’m a vehicle to discuss other possibilities. It’s why I say that there's something we need to understand, that we need to love each other. From love to hate there’s less than a space. We’re centered in hate but not in love. All the philosophies and religions speak of love. Everybody with three fingers of conscious in their brains talks about love, and it’s what we need. Carmen Pelaez is a Cuban American, Miami-born filmmaker, writer, playwright and performer.